Once a year, every person in Quill gathers for the Purge, where every 13-year-old is sorted into one of three categories: Wanted, Necessary, or Unwanted. The Wanteds go to the university, the Necessaries get the hard jobs like farming, army work, or burying dead bodies, and the Unwanteds are “eliminated.” In other words, they are killed. Or at least that's what everyone thinks. The Unwanteds are those who are creative. In Quill, everyone sees creativity as a weakness. Anyone caught being creative has committed an “infraction,” and on the day of the annual Purge, will be eliminated. Alex has several infractions. When the Unwanteds walk through those gates, they enter the world of Artimé, a world where creativity is embraced rather than shunned. Where people are taught to flaunt their creative skills, and where people are taught to use art not only as a hobby, but also as a weapon. You see, Artimé is not just a creative world, but a world of magic. As well as learning to draw and paint better, Alex learns how to paint himself invisible, use scatterclips, and draw 3-D doors and windows in such a way that he can open and pass through them like normal doors or windows. Aaron Stowe, Alex's brother, is a Wanted, and Alex misses him terribly. But since Aaron is a Wanted, he believes Alex to be dead and has likely forgotten all about him, like he was instructed to do. But just how far will Alex go to reach his brother? And what are the consequences? Kirkus Reviews described the story as “The Hunger Games meets Harry Potter,” which for the most part is true. Alex gets shipped off to some place where he goes to a school and learns magic (Harry Potter), and comes from a place with a seriously corrupt government (Hunger Games). This book shows the bond between siblings, and how important it is that that bond stays intact. Here's a message that I got out of this story: Never hide your talent. Flaunt it and be proud. Daddy's afterthoughts: Kirkus inadvertently indicts it as yet another trope-fest of recycled elements from better-known stories, though in this case, I cannot complain too much; the series is a good developmental stepping stone for heavier fantasy fare for developing young readers. 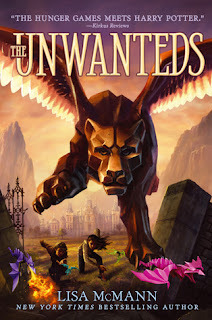 This fun (well, as fun as a dystopian fantasy can be, anyway) series by Lisa McMann is seven books long, and each book is around the 400-500 page range. Where this differs from other works of that length in the fantasy genre is that, at least in the paperback edition that Julia has, the text is slightly larger and spaced in such a way that it is the equivalent of another book a good third shorter; in other words, this first book in the series, at 390 pages, reads like a 250-300 page book (by comparison, say, the first Potter book). This makes for a great opportunity for avid fantasy readers in the age 8-12 range whose reading stamina might not be quite up for 500-800 page books to bask in the genre without getting lost in the text; with Lexile scores hovering around 800, readers of most ability levels will be able to enjoy a set of characters and stories that spans over 3,000 pages. And older readers can enjoy the rich storylines despite the (relatively) easy reading level. Another plus, the books (as of this writing anyway) seem to be about half the cost of normal YA fiction. As of December 2017, I see them for $4.99 each in paperback new on Amazon, and the complete hardcover box set, all seven volumes, is only $70 (ten dollars a volume for hardcover is pretty remarkable). Also, in her online bio, author McMann specifically remarks that she likes bacon, so, you know, #winning. Thanks! I thought it was a pretty great book! I plan to read all the sequels too.